Where did liturgical worship and especially the Divine Liturgy of the Orthodox Church (…) come from? What were its origins? How much change has there been over time from the beginnings of Christian worship in the first century Jerusalem Church? One should begin by answering the most basic question: what is liturgy? The best translation is “the work of the people.” That is the collective work which assembled believers do together in offering praise and worship to God. Jews at the time of Jesus Christ had already had a history of worship almost 1500 years long. Their history was full of interaction with God Who called them to be His people, and Who had revealed to them specific instructions as to the offerings and sacrifices which were part of the way in which He was to be worshiped. The Bible is clear that God revealed to Israel how to worship, and it was patterned after things in heaven. These specific forms or liturgies of worship were first seen in the Tabernacle of the early Israelites, and were consummated in the Temple worship which took place later in Jerusalem. The worship of God in the Temple in Jerusalem was the first and most prominent focus of Jewish worship, which included the form and frequency of prayer and sacrifice. For Judaism there had always been a constant cycle of prayers, blessings and meals: daily, weekly, monthly and annually. These constituted the second focus of worship for the Jews. In its most regular form it included practices in the daily hours of prayers and the annual High Feast Days. The High Feast Days included the sacrificial offerings of the Temple and contained Jewish messianic expectation. These meals included the “breaking of bread” and the “blessing of the cup”, and contained parallels with both the temple sacrifice and the messianic feast. There was a “meal liturgy” for the prayers of the meals, and in principle they were required for every meal. However, it took on the greatest importance in family meals and especially the meals of the Holy Days. The entire structure of the Last Supper as recorded by St. Luke mirrors the meal liturgy as practiced within Judaism at the time. These meal prayers and their structure contributed directly in the formation of the early Christian celebration of the Lord’s Supper. The third and later focus of worship was that of the synagogue. For the average Israelite, the Temple was a place of worship only on certain days of the year, and it was most specifically a place of sacrifice. During the Babylonian captivity, worship in the Temple was impossible. A new form of worship came into being, a form focused patterned on temple worship, but without the sacrificial element which took place only in the Temple, and with a strong didactic element of teaching and remembering. These two elements of Jewish worship — synagogue and temple — together formed the very basic components of the form or order of the liturgy for the early Christian Church. Besides the structure or order of worship that came from Judaism into Christianity, one can also find the cycles of liturgy — the daily, weekly and yearly cycles of worship-coming from the Old Testament as well. Acts 2:46 says that “day by day, continuing steadfastly with one accord in the temple, and breaking bread at home, they took their food with gladness and singleness of heart”. On a daily basis the Apostles continued their Jewish worship practices in the temple, and on a daily basis broke the bread of communion. This regularity of time is further confirmed in Acts 3:1 where Peter and John were going to the temple because it was the hour of prayer. Not only did they continue in Jewish worship practice, but they kept the liturgical cycle of daily prayers at set hours of the day as well as the major feast days. Christian worship, then, was a Christ-centered pattern that continued and preserved the traditional structure of synagogue worship and the meaning of temple worship that the Lord had established in Israel. This basic structure included the Old and New Testament practices of liturgy, baptism, and Paschal feast that became the Eucharist, and certain of the feast days. The continuity of temple and synagogue worship practices characterized the Church in its earliest days, and the synagogue form became the basic order or worship for the Christian Church. This structure was set very early during the New Testament era while the Church was still seen as essentially a Jewish sect, a messianic sect believing in Jesus Christ. The setting of this order or form of worship took place even prior to the admission of Gentiles into the Church, and before the spread of the Gospel outside of Judea. Therefore, by the time the Gentile missions began in about 38 A.D. (and later enhanced by Paul’s missionary activity), this order was established and accepted as the form of Christian worship. 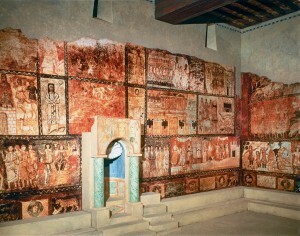 Into the basic synagogue form were blended other elements from the temple as well as some uniquely Christian elements. Regarding the Temple, it is important to realize two things about its worship. First, the primary type of activity was sacrifice. The cadence in the spiritual lives of most Old Testament Jews was the celebration of the Holy Feast days — and their corresponding offerings. And what determined the manner in which these sacrifices would take place? God had given the instructions in Exodus and Leviticus which describe in detail the manner in which worship is to be offered to God. Secondly, worship in the temple — and in fact all Christian worship — was and is to reflect worship in Heaven. The Scriptures provide glimpses of heavenly worship. There are reports of it in Isaiah 6, Daniel 7, and Revelations 4 and 5. It was upon this heavenly worship that the worship of God on earth was patterned. Exodus 25 through 27 provides detailed information about the nature of temple worship, including the physical structure of the temple and its dimensions, instructions for the Ark to be built, the internal décor of the Tabernacle, details of the priests’ vestments, the use of incense, the presence of an altar, the daily offerings, the use of anointing oil, and the use of images. The original Ark, which disappeared in the exile, had held the Tablets of the Law. It was understood both as the place of sacrifice and the place from which God spoke — the place of communion. This is one reason that in Eastern Orthodox Churches there are representations of two cherubim behind the altar on which the bread and wine are consecrated to become the Body and Blood of Jesus Christ who was sacrificed for mankind. And between and before them is the altar at which the communion takes place in the Eucharist. Further, on the altar stands a candleholder with seven candles, in the manner of the Jewish Menorah, the light of which is the sign of the presence of God. Some of these elements remain in Western Roman Catholic Churches, although a great deal of it has changed since Vatican II. These elements constituted the revealed manner in which the worship and sacrifice of Israel were to be made to God. Again, the primary function here was that of sacrifice: the offering of an animal to propitiate and atone (make amends or reparation) for the sin of God’s people. The belief of the early Church was that the sacrificial death of Jesus Christ and His subsequent resurrection supplanted all temple sacrifice as a means of propitiation and atonement. In the sacrifice of Himself, Jesus Christ becomes the propitiation for all of mankind’s sins; He is the Lamb of God, who takes away the sins of the world (John 1:29). Thereafter, for Christians, there was no need for an additional sacrifice. The Good News of Jesus Christ is that sins are forgiven in Him, and in Him Christians are reconciled to the Father. So why continue any of the temple practices? Because they included communion as well as sacrifice, and because they constituted revealed worship — they were part of God’s intent from the beginning. And because temple worship was fulfilled in Jesus Christ, the worship which Christians offer to God goes on forever. It continues both here on earth and in Heaven before the Throne of God. To be specific, heavenly worship is the worship, the liturgy. That is, Heaven is a dynamic condition of praise and worship — of liturgy — to the Father. And earthly worship partakes now of the eternal, heavenly worship. For example, Hebrews Chapter 8 describes the role of Jesus Christ as the heavenly High Priest in contrast with the Old Testament priesthood. And what is the word used to describe what the High Priest is doing? It is liturgy. The passage properly reads from the first verse of the chapter as follows: “We have such a high priest, one who is seated at the right hand of the throne of the Majesty in heaven, a liturgist (leitourgos) in the sanctuary and true tabernacle which is set up not by man but by the Lord.” (8:1,2). The worship of heaven, the liturgy, has been established forever by God Himself. Hebrews then goes on to demonstrate that what is done on earth should be patterned after that in Heaven — both in the Old and New Covenants. Literally, “now Jesus has been given a liturgical work (liturgist) which is superior to theirs, just as the covenant which He arranged between God and His people is a better one…” (8:6). According to the Bible there is worship in Heaven, and it is to be our pattern. The original Greek word in every major early test is leitourgos. It means liturgy, or liturgical worship. It is easy to understand why the early Christians continued in their synagogue and temple practices. Worship had been revealed to them by God. Jesus Christ was the fulfillment of all that God had promised in the Old Testament; in Him all the hopes of Israel were fulfilled. It was only natural that in worshiping God through Jesus Christ, believers would continue to do so as they had been told, in the manner God revealed to them. This was natural, almost automatic for the Jews who accepted Jesus Christ as Messiah. There was, however, one major change for these Jews which had been completed in Jesus Christ. The animal sacrifices of Old Testament practice had been fulfilled in the person of Christ. All that had been anticipated was now completed. All that had been prophesied was now reality. The Messiah had come. So for these early Christians, the Jewish worship practices were continued with a brand new understanding of the centrality of the victorious Christ, and new-found joy. Christians did not view their Jewish liturgical practices as passé. Nor did they simply continue in some kind of mindless habit of outmoded ritual. They maintained this liturgy as their own, as described in the inspired Scriptures of the Old Covenant carried over into the New. In fact, that Jewish liturgy made the work of God in Jesus Christ comprehensible. The Old Testament worship practices, now fulfilled and given new meaning in Christ, became the core of Christian worship within this New Covenant. If one realizes that Jewish worship was liturgical and provided the worship structure for the early Church, and then one reads the New Testament seriously, a whole new side to the question becomes clear. The earliest and clearest reference to liturgy comes in Acts, the book which chronicles the inception and growth of the early Church. The church at Antioch was the first Gentile church outside of Jerusalem, established approximately A.D. 38 when Barnabas was sent to teach there (Acts 11:25 ff.). Acts 13 describes the selection of Barnabas and St. Paul for the first missionary journey. This would have taken place approximately A.D. 46, in what by then was a well-established and structured community of believers. Luke records that the calling of Paul and Barnabas was the work of the Holy Spirit, and that it took place during the “liturgy”. The text reads, “as they were ‘liturgizing’ (leitourgounton) before the Lord and fasting, the Holy Spirit said ‘Set apart for me Barnabas and Saul to the work to which I have called them'”(Acts 13:2). Luke was a physician and well educated. He must have understood what he meant to say about worship: namely, that the community was together in formal and ritual worship, accompanied by fasting, when the Holy Spirit spoke. So in A.D. 46, this early church was worshiping in a liturgical manner using a Christian form carried over from the synagogue. And this was within sixteen years of the resurrection of Jesus Christ. The continuity of worship between the Old and New Covenants is very evident. 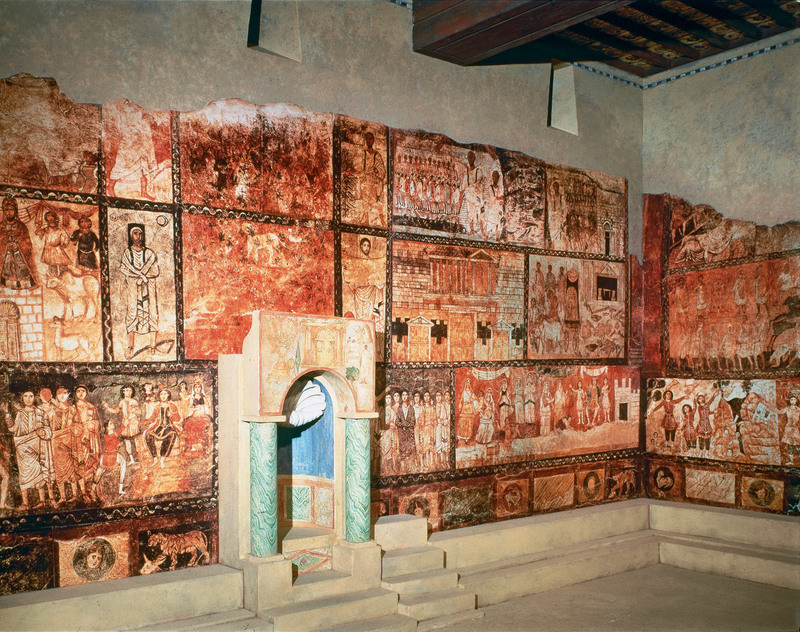 "Iconography" in Jewish Synagoge in Dura-Europos, dating back to the 2nd century AD. Consider Exodus Chapters 12 & 13, 25-31; Isaiah 6; Daniel 7; Revelation 4 & 5, among others. Parts of this page are excerpted from: Williams, B. and Anstall, H.; Orthodox Worship: A Living Continuity with the Synagogue, the Temple and the Early Church; Light and Life Publishing, Minneapolis, 1990. This book is available from our liturgical web store (learn more here).